Pedestrians can cross over the Boat Works lagoon on an old railroad bridge that is part of the Riverwalk. A few months earlier than planned, the city has opened up the Riverwalk on the south side of the Fox River between Wisconsin and Oregon streets so that the old "bridge to nowhere" can be used by bikers and pedestrians. The Riverwalk still has some "punch list items" to be completed," said City Manager Mark Rohloff. But "that portion of the Riverwalk may be walked upon." He said an official opening ceremony will be planned once lighting has been installed. For now, "call it a soft opening," he said. 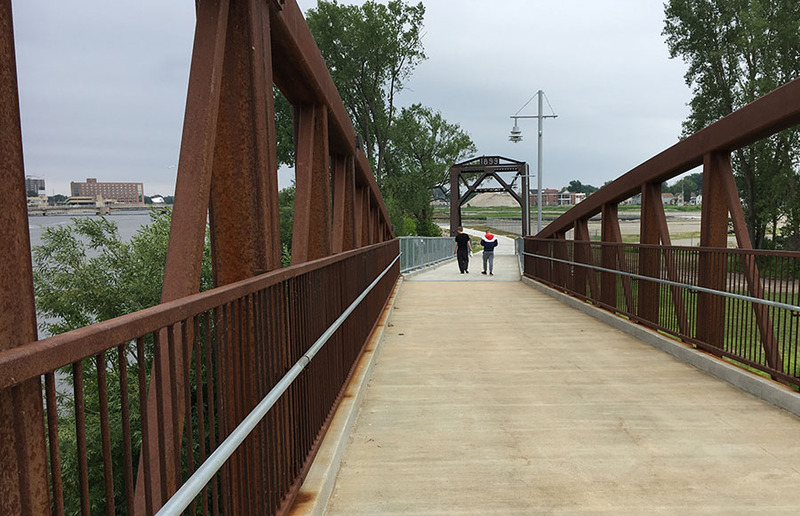 The city was aided by some favorable construction bids that allowed it to move more quickly than expected on finishing this section of the Riverwalk. Previously the Riverwalk passed through William A. Steiger park but ended where a railroad bridge was installed over a lagoon and onto a small island at the old Boat Works property. This structure was dubbed the "bridge to nowhere" since it was blocked off until the rest of the Riverwalk could be built.